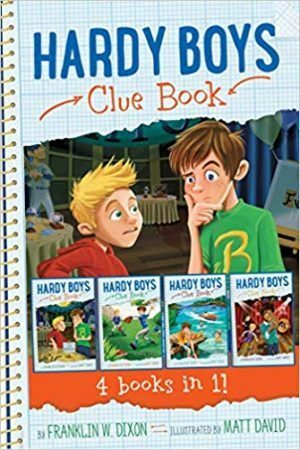 hardy boys news | Edited by Rev. R.W. Finnan. 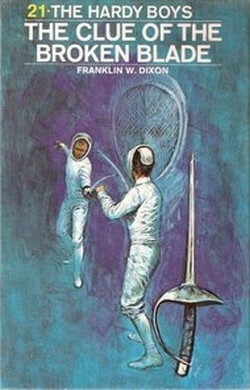 The latest news, reviews & articles for fans of Franklin W. Dixon's Hardy Boys mystery books since 2005.
bayport beatWelcome to the March edition of The Hardy Boys News with a look at upcoming releases and the book of the month, “The Mystery Of The Flying Express”. Kenner Hardy Boys Dolls Used As Prototypes For Star Wars FiguresI got this information and scans from “Vic”, a Star Wars collector who wishes to remain anonymous. I recently purchased a collection of Kenner prototypes that included some unique Hardy Boys items. 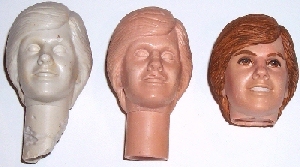 Specifically, I have four Hardy Boys action figure (doll) head prototypes – three Joes and a Frank. The Frank piece has a tenuous connection to Star Wars (more about that at the end). I’m not sure how much you might know about the processes used to create toys like this, but a brief summary is needed to explain these pieces. First, a sculptor creates a head in a relatively soft material such as wax, this is referred to as the sculpt. A silicon mold is made of the sculpt, and the mold is filled with a hard material to create what’s known as a hardcopy. (A soft material is good for sculpting, but the actual tools for making the toys have to made from hard materials.) One of these hardcopies is then used to create the actual tooling for the production figures. There are a few other important details to note – for example, if the sculptor wants to make an experimental change to his sculpt, he might create a wax casting so that he can modify that without destroying his original, in case he’s not satisfied with the revision. Also, extra hardcopies are made for purposes other than tooling. Often, hardcopies are used in catalog photography and licensing approvals, and some hardcopies are painted by hand to test and finalize paint schemes for the final toy. The pieces I have include a wax Joe head, an unpainted hardcopy Joe head, and a hand-painted hardcopy Joe head. I don’t know if the wax is an unused casting, or if sculpting was done on it, but I do believe that it is a casting. The painted hardcopy is only painted on the front, so I’m sure it’s not the final paint master; given the soft rendering, I suspect that it’s a very early paint sample. To make things a bit more interesting, the Joe doll was originally presented to buyers with an entirely different head than he was eventually produced with, and the three Joe pieces I have all reflect the original, unused head sculpt. As for the Frank head, what I have is a painted hardcopy that’s similar to the painted Joe head. 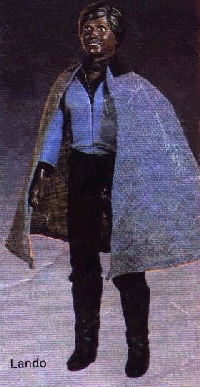 The tenuous Star Wars connection – which might amuse you – is that when Kenner was prototyping a never-produced Lando Calrissian doll, they put the outfit on a Frank Hardy body, and painted him black. So, until I get an actual Lando head, I’m displaying the Frank Hardy head with my unproduced Lando outfit. You might also be interested to know that Frank was also used as a stand-in for Harrison Ford (Han Solo) at one point. I showed photos of these heads to Gus Lopez (the guy who runs the Star Wars Collector’s Archive) and he believes that none of the heads are hardcopies – the beige pieces are just a much harder kind of wax. He agrees that these are probably castings, as opposed to an original master sculpt. For what it’s worth, if these were 12″ Luke Skywalker heads, I could probably get $300 for the first two, and $500 or more for the hand-painted one. As documented unproduced variant heads, they’d probably go for a fair bit more than that. 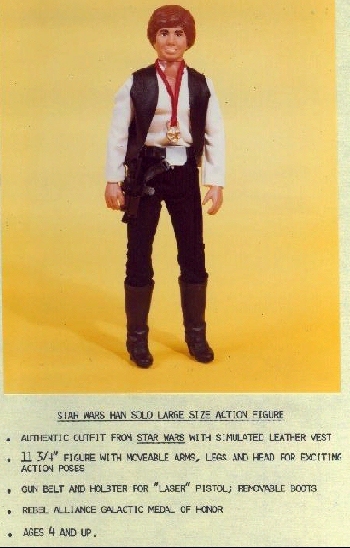 Then again, in Star Wars collecting, Kenner’s 12″ figures are one of the most important segments for most collectors, and I gather that in the world of Hardy Boys, the dolls are relatively unimportant. Notes: Harriet S. Adams also signed a release form for the original edition. 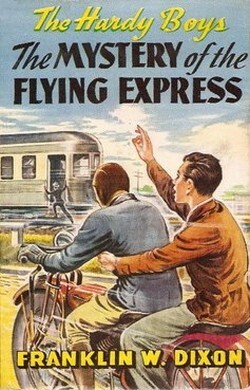 The Hardy Boys break up a spy ring which uses the speedy “Flying Express” train to maintain contact with its East Coast agents. 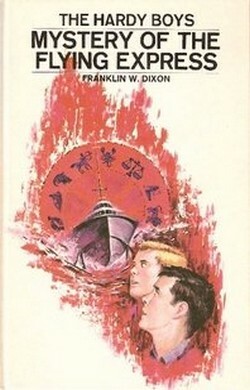 Revised: The Boys investigate the disappearance of the speedy hydrofoil ferry, the Flying Express. Description of current edition: A sleek new hydrofoil is scheduled to start ferrying passengers between Bayport and Cape Cutlass. But business enemies of the hydrofoil owner have stirred up a hornets’ nest of violent opposition among small boat owners. 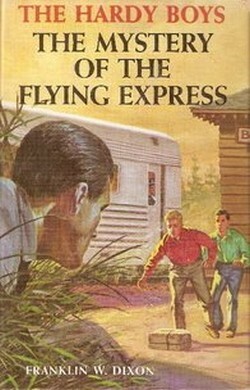 Fearing sabotage, he begs Frank and Joe Hardy to guard the Flying Express on her maiden trip. Startling developments plunge the teenage detectives into a dangerous chase by sea, air, and land in pursuit of a gang of hardened criminals who operate by the signs of the Zodiac. Tension mounts when the Flying Express vanishes – and so does Sam Radley, Mr. Hardy’s skilled operative. Peril stalks Frank and Joe’s every moves as they hunt down the terrifying gangleader Zodiac Zig and his vicious henchmen. please use PayPal to donate towards its necessary financial support by clicking on the link below. Thanks to everyone who has donated or made purchases thru my Amazon.com links! 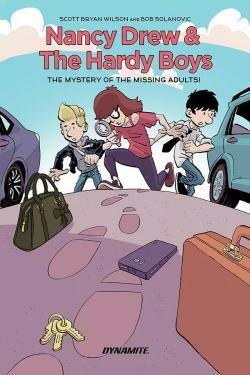 bayport beatWelcome to the February edition of The Hardy Boys News with a look at upcoming releases and the book of the month, “The Disappearing Floor”. 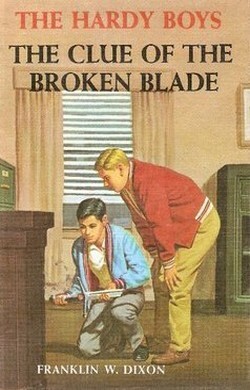 There was a Hardy Boys article in a recent issue of The Atlantic. Jenn Fisher of the Nancy Drew Sleuths was kind enough to send me a copy of her magazine The Sleuth which had an interesting article about the Super Mysteries. The Hardy brothers and Frank’s new girlfriend, Jones, are attending a local comic book convention on the shore. They meet up with Jones’s friend Harper, a fellow comics super fan, on the boardwalk outside the convention. The four of them spend hours running from booth to booth and end the perfect day with pizza at Harper’s short-term rental apartment. Things don’t stay so perfect, though. On the way home, Jones realizes she switched phones with Harper by accident and she is getting some really scary texts. When they show up at the apartment the next day, they find it totally destroyed and Harper is missing. Frank and Joe start digging into their new friend’s life, hoping to find out where she might have gone, but the more they find out about her, the more mysterious she becomes. Can Frank and Joe find this secretive character? Or has she disappeared forever? 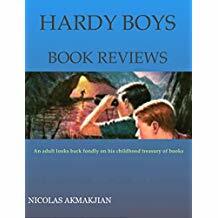 An adult fondly looks back on his childhood treasures: the original 58 Hardy Boys volumes. These were not great literature, but they were never meant to be. They are actually surprisingly well-written for children’s books. The great writer Leslie McFarlane got things off to a terrific start and the series benefited from that great foundation. Each of the 58 books is reviewed in this book. 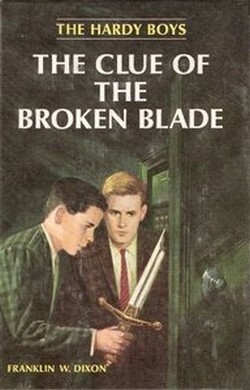 This content comes from the popular HardyBoysBookReviews.com site, noting who wrote each book, when it was written (and revised), the cover is critiqued, the chums who appear are noted, and what Aunt Gertrude baked for her beloved nephews is gravely noted. This book expands upon that material, however, to also include notes about the year in which the book was written. What film won the Oscar that year? What was the #1 song? What events happened that year? All of this goes into the mind of the author and you can see that influence in the books. When James Bond shows up in public consciousness, you can absolutely tell in the Hardy Boys. The space race, multiculturalism, post-World War II expansion, the Depression, and, of course, Scooby Doo are all reflected in these books. These are light-hearted, brief reviews that do not spoil the plot. They are written with humor and affection. If you read the book, the review will remind of the basic plot, but will not reveal the identity of the villain. For that you have to read the book again — and this book will make you want to do just that. Notes: Original text PC editions are scarce. The original text edition is generally regarded as the worst written story in the canon. 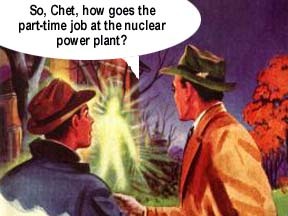 The Hardy Boys smash Duke Beeson’s (AKA Chief Shining Light Of The Sun-Worshipping Ozonites) robbery gang using the weird inventions of Aunt Gertrude’s former classmate, Eben Adar. 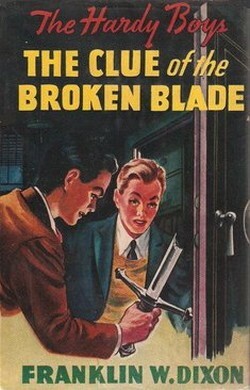 Revised: The Hardy Boys track down a gang of jewel thieves in a mysterious old mansion. 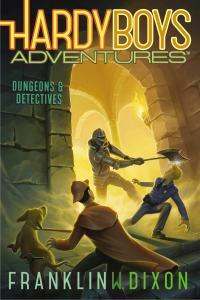 Description of current edition: Once again Frank and Joe Hardy take on a puzzling case when their famous detective father asks the boys to assist him in tracking down a notorious jewel thief and his accomplices. The trail leads to the outskirts of the Hardys’ home town and to a weirdly guarded mansion on the old Perth estate. 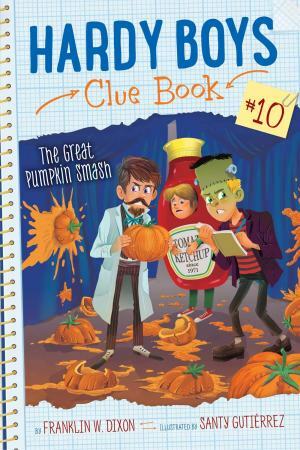 With their pal Chet Morton, the brothers must tackle the mystery of the mansion heir’s sudden death. 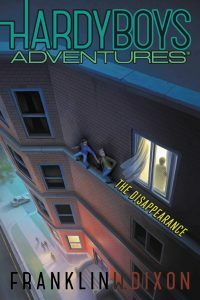 A disappearing floor, a huge, savage-looking, hound, a galloping ghost, and a college professor’s startling invention are just a few of the strange elements that complicate the boys’ efforts to solve both mysteries. The Plot: While on a camping trip with Chet, the Boys discover a cave containing stolen bank loot, shortly thereafter, they run into the robbers themselves and also (big surprise here), Fenton Hardy, who is hot on the trail of the robbers. The bank robbing gang is headed by Duke Beeson (aka Chief Shining Light of the sun-worshipping Ozonites.) Several banks are robbed and the Boys trace the gang to the strange house of eccentric inventor, Eben Adar, a former classmate of Aunt Gertrude’s. After several chapters of weird inventions and goings on, the Boys and their father capture the gang. Comments: Although this story’s weirdness has always endeared it to me and made it one of my favorite Hardy stories, in all honesty I must say it is very poorly written. It is episodic and disjointed and seemingly written without a care to continuity. It stumbles along and doesn’t really get interesting until the last third of the book, when it starts to get weird, almost surreal. The Boys are constantly in motion, going here and there for no apparent reason other than to fill up chapter space. Not one person in the story displays one iota of common sense at any time. 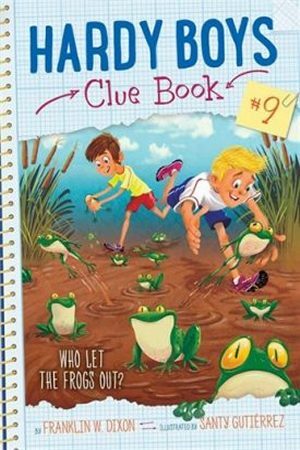 The Boys are attacked when they return stolen bank loot, a police officer threatens them with a drawn gun when the Boys, Callie and Aunt Gertrude go to Callie’s parent’s summer cabin, the Boys are frozen solid and set adrift in a row boat, Beeson saves the Boys from a tiger attack. None of these events (along with many, many others) have the slightest bearing on the plot (such as it is!) “Who is Harry Tanwick?” Joe doesn’t know and neither does the reader. 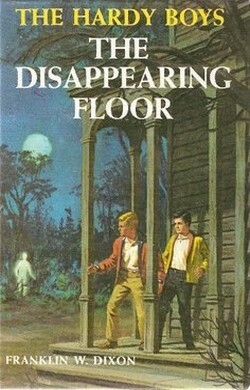 The Disappearing Floor (unrevised edition) holds a special infamy among Hardy Boys fans. Ghostwritten by Dr. John Button in 1940, it has all the literary style of a car wreck; and like a car wreck, you want to look away, but somehow just can’t. While admittedly there are Hardys stories that aren’t that great, Floor is in a league of its own for sheer weirdness. The plot is almost nonexistent. Bizarre sci-fi gadgetry is prominently featured, along with a Fenton Hardy who seems to appear at will. This is all the more amazing since Mr. Hardy is seriously injured twice during the book. Of course, the oddest thing of all is that this book was ever published in the first place! So, having said that, let’s move on to my highly condensed recap of the story, which reads like a spoof, but isn’t; I haven’t exaggerated a single plot point, not even the contents of the canvas bag. I have, however, reworked the narration and dialogue to reflect my own take on the story. Dark-haired Frank Hardy and his blond brother Joe sat around the campfire, along with their chubby friend Chet. Frank and Joe exchanged amused glances. Chet’s tragic eating disorder and the resulting morbid obesity were a reliable source of humor for the two brothers. “I wonder who Harry Tanwick could be,” pondered Frank. “Maybe that’s him over there!” shrieked Chet, and the three ran into the darkness after a shadowy figure. As the trio charged into the pitch-black wilderness, they suddenly fell headlong through a hole into an equally dark cave. They were now trapped! “Well, this is quite a pickle, I must say,” observed Joe. “Still, we seem remarkably fit for having fallen twenty feet onto solid rock,” countered Frank. “I’m still hungry,” grumbled Chet. “I should say so!” confirmed Frank. Thoroughly familiar with what to do in this situation, Frank suddenly lunged forward and threw a chokehold on the vehicle’s driver. Despite this prudent measure, the taxi swerved out of control and plunged into the dark, icy water. Frank, Joe and Chet narrowly escaped a watery death, swimming to the surface, while clutching the canvas bag containing $82,000 in coins. “Except for our sending a taxi off a bridge and almost drowning,” added Joe. “Well, yes,” agreed the detective. “But we’ve recovered the money already,” Joe pointed out. “And Beeson’s men have already caught us in there –twice– and threatened us each time,” recounted Frank. Frank and Joe exchanged meaningful looks. Their father had a good point. Someone with a name like that had to be up to no good. No butts about it. The next time that the boys randomly bumped into their father, he was moving at high speed, since an escaped tiger was pursuing him. Fortunately, Joe knew well that the surest way to fell a charging tiger was to bounce a sharp rock off its head. Quickly abandoning their badly mauled father to the medical authorities, Frank and Joe continued to pursue Duke Beeson. Soon they caught up with him, at which point he effortlessly captured the two brothers. “Where we takin’ these two punks, Boss?” inquired the gruff henchman. “To Eban Adar’s house,” grunted Beeson, who was now dressed as an Indian prince, for reasons we need not go into. Frank and Joe exchanged glances again. Eban Adar was Aunt Gertrude’s oddball acquaintance from her school days. “Okay,” moaned Frank, rubbing his aching head. “Tell it to me one more time. How did we end up in this rowboat? “Frozen solid. And now, shortly after, we’re fine. Honestly, Joe! You have to admit it’s pretty farfetched,” commented Frank. “If you won’t like the answer, then don’t ask the question,” snorted Joe. Joe picked up Adar’s telephone receiver and engaged the operator. And Joe then replaced the instrument in its cradle. Just then, a grubby-looking man in a dark ragged jacket approached the boys. “Are you Joe Hardy?” he snarled. “Why, yes, I am,” Joe acknowledged. Without warning, the stranger delivered a powerful blow to Joe’s midsection. Caught unawares, Joe crumpled to the ground in blinding pain, as Frank watched in stunned disbelief. There you have the plot, such as it is, of the most surreal Hardys episode ever. Inexplicably, Dr. Button was then allowed to helm the next volume: The Mystery of the Flying Express, infamous in its own way for its blatant errors, such as Laura Hardy being called “Mildred.” The only possible explanation I can give for Button’s continued employment was that perhaps Leslie McFarlane had his leg caught in a bear trap, somewhere in the Canadian wilderness. 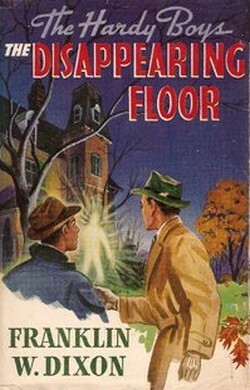 Be that as it may, The Disappearing Floor continues to hold a special place in the hearts of Hardy Boys fans, in the same way Plan Nine from Outer Space holds a place in the hearts of sci-fi fans. Sometimes if you go far enough into bad, you reach good.